I'm sure I'm not the only one who got a nice form letter from Audi in the mail today. They're advising owners that replacement auxiliary cooling pumps still are mythological creatures, but maybe in December they'll send us more letters to advise if those will be available. In the meantime, it is URGENT that we make an immediate appointment to have a dealer disconnect the existing auxiliary cooling pump. For unspecified urgent reasons, meaning they've probably seen a few more catch on fire, and in the next 90 days they're afraid too many more will. Just, you know, in case you missed the mail. It is so nice to know that running without that aux cooling pump will not damage my car, so apparently it is there for no functioning reason. And doubtlessly, we're uncapable of simply unplugging the damned thing ourselves. Anyone know just how ornamental and useless that pump is? Or, where the harness connection is, to disconnect it? Anyway the diagrams are not too clear but it looks like it is near the A/C compressor. It is a shame they cannot seem to get this type of pump right still. My B5 S4 circa 2000 had the dumb aux pump under the intake manifold. It failed and leaked back then (at least no fire)...the TSB with revised pump relocated it near the power steering pump...sorta where it seems to be now on the Q5. Hey Redd did you say FIRE ? I like your idea of the concierge at home service.I know Rolls used to do this.Damn Brits.But now they're damned Germans ! Maybe the dealer is going to physically remove the pump, connect the two hoses together, and call it good, without ever replacing the pump in the future. 1. Mechanically driven main coolant pump. 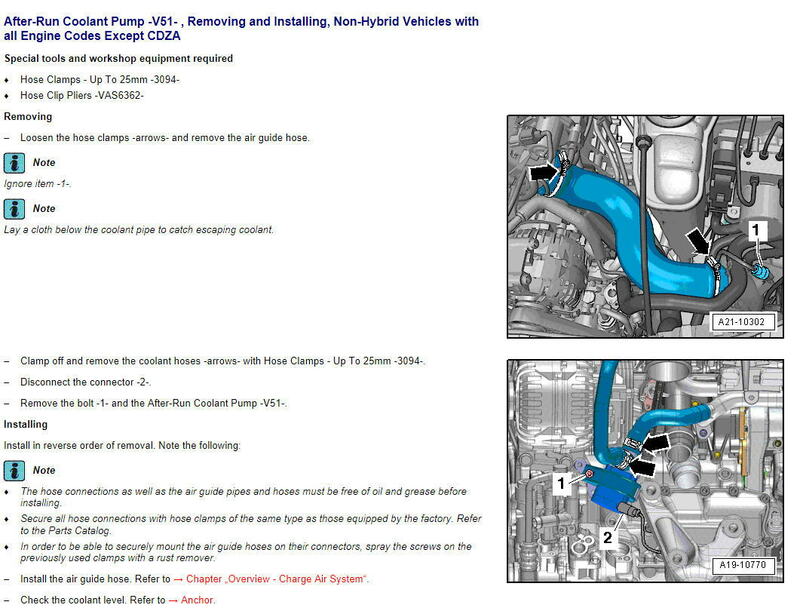 I believe Audi is talking about the V51, because they tell you not to park it indoors after driving the Q5 with a questionable Aux Cooling Pump, as this pump runs after the Q5 is shut off. will be off warranty by now, so turbo replacement is at owner's cost and not Audi's. Last edited by Bob Petruska; 09-25-2018 at 02:42 PM. Where's Bruce Willis when you need him? "Cut the BLUE WIRE! THE BLUE WIRE!" "No, WAIT WAIT, CUT THE RED ONE CUT THE RED ONE NOT THE BLUE ONE!" Really, this crap could have been offered to me three MONTHS AGO when I asked Audi about it, and had some free time to screw around visiting Cafe Audi. But no, all of a sudden it becomes an imminent danger NOW and it wasn't then? If my Q5 burns to the ground, makes my decision as to what new model( Alfa, Jaguar, Volvo) to buy a quicker decision. Since I was passing by the dealership today, I stopped in to ask about the recall notice. Either I've forgotten how to read, or AoA are up to the old games again. Service writer looked it up, and confirmed THEY DO NOT SIMPLY UNPLUG THE AUX COOLING PUMP. This being the pump that is "at" the turbine to keep it cooled down especially after engine shut-down. They unplug the pump and then, as I had been wondering, THEY INSTALL A JUMPER so the ECU won't throw a fit about the auxiliary cooling pump being unplugged. So, they can't just "unplug it", they need an hour to schedule a procedure. OK. So I ask the nice man, if my turbine needs that cooling pump, and I'm going to be driving without it for a month or three, isn't that going to, you know, affect the longevity of the turbo? Yup. He's expecting that AoA will issue an extended warranty on the turbo parts because of the anticipating higher rate of damage caused by running them without the auxiliary cooling pump. Isn't that nice of them? So...perform the interim fix, disconnect the pump, and wait to see if the engine slags down at some future date? Or, wait for a new pump in January, and hope the car does or doesn't burn to the ground before then? Decisions, decisions....I'm surprised they don't offer to simply disable the entire turbo unit in the interim. Or...dare I ask, can VCGS disable the turbo? Please please? Last edited by Redd; 09-28-2018 at 11:10 AM. Well, in the combined wisdom (is that the same as "conspiracy" ? (G) of the NHTSA and AoA, there was no immediate fire danger from the original problem. Just the slim chance that it might burn the house down, so it should be parked outdoor for nine months or so. Now...they are saying there's still no immediate danger for most of us "but" there's a way to make the cars safer. Which will prevent the fires that almost certainly would never happen, but which will absolutely guarantee some damage or excess wear in every turbo unit. So, the choices are: 1) You follow the recall notice, go to Cafe Audi, guarantee premature or excess wear on your engine. Or, 2) You ignore the recall notice, and in the previously determined extremely unlikely event that your car catches fire and the building burns to the ground, AoA will stick their tongue out and say "We told you so!". And here I went and bought a turbo because I thought that by then, they'd gotten all the long-term reliability and durability issues worked out. Ha. It sounds like they have backed you into a corner. What about just replacing it yourself? I know not ideal, but then again...rock-hardplace. Or is it just that there are none available anywhere at all?